Bandel, West Bengal, Feb 12: A three-day celebration for the 27th `World Day of the Sick’ (WDS) concluded yesterday at the historic 420-year-old Marian Basilica in Bandel, West Bengal, with prayers for healing as well as anointing of some fifty sick people besides unveiling of a commemorative mural. 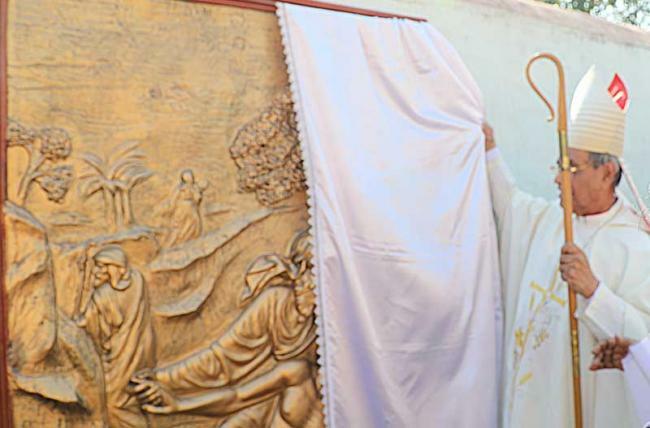 The mural was created by Church Art of Kolkata - depicting the story of Good Samaritan parable of Jesus Christ - by Papal delegate Cardinal Patrick D’Rozario of Dhaka in the presence of the Prefect of the Vatican Department for Promoting Integral Human Development Cardinal, Peter Kodwo A Turkson, Archbishop of Kolkata, Thomas D’Souza, Prior of Bandel Basilica, Fr T L Francis, and other delegates. “Some 200 International and national delegates arrived in Kolkata amid ethnic dances by Bengali, Santhal and Adivasi groups,” said Prior of Bandel Basilica Father T L Francis. The delegates paid homage to Our Lady of Happy Voyage. Celebration of the solemn Eucharist was presided over by Patrick D’Rozario, Archbishop of Kolkata, Thomas D’Souza and Cardinal, Peter Kodwo A Turkson of Ghana, and eight bishops of Bengal and from other parts of the country. The Bandel Church was chosen for the conclusion of World Day of the Sick as daily people of all faiths visit this Shrine to seek favours. Devotees come to thank Our Lady of Bandel to receive blessings. The date 11th of February marks the date of the miraculous apparitions of the Blessed Virgin Mary at Lourdes in France. On this day, sick people come in large numbers to experience miraculous healing. The Marian Apparitions at Lourdes were reported in 1858”. The 4 feet by 6 feet mural depicts the story of the Good Samaritan - a parable Jesus Christ told on need of reaching out to help those in need. Established by Portuguese Augustinian monks in 1599, Bandel Church came under the charge of the Salesians of Don Bosco in 1928. Saint Pope John Paul II declared Bandel Church dedicated to Nossa Senhora do Rosario – Our Lady of the Rosary – into a Basilica in 1988 in view of the 400th year celebrations.